PresidentMuhammadu Buhari said his administration has pursued, with vigour, its three cardinal points of waging war against corruption, curbing insecurity and the provision of critical infrastructure to the people, with a promise to do more if re-elected. Buhari said this, yesterday, at the Enyimba International Stadium, Aba, Abia State, while addressing a mammoth crowd when the All Progressives Congress (APC) presidential campaign train moved to the state. 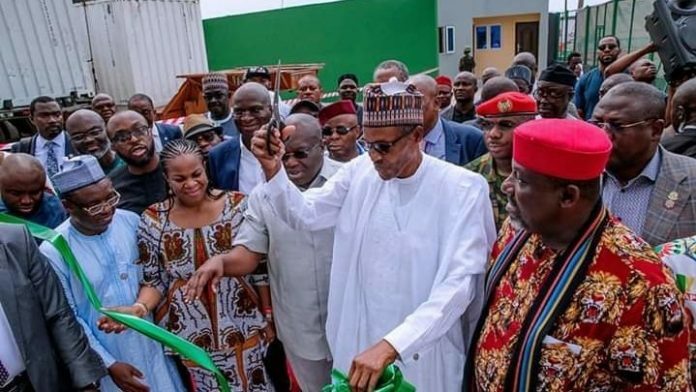 This was even as the Secretary General of Ohanaeze Ndigbo, Uche Okwukwu, poured encomiums on the president for the laudable projects the Federal Government is executing in the South East. The president said when the APC government came to power, the price of oil in the international market was at its lowest ebb, coupled with the activities of Niger Delta militants, which he said forced down drastically the country’s oil production quota. He said despite all these, the APC government has been able, in the past three and half years, to establish power plants, build roads and railway lines across the country. Buhari said his government is committing the scarce resources at its disposal to improve on what it has been able to do in the past years and told the people of Abia that with their support, Dr. Uche Ogah will be their next governor. National Chairman of the APC, Adams Oshiomhole, said the president has seen for himself the number of people who turned out at the stadium, coupled with the testimonies of traders at Ariaria and elsewhere, therefore, he does not need anybody to tell him the people love him. Oshiomhole alleged that the People’s Democratic Party (PDP) has ruled Abia State for nearly 20 years without doing anything for Abians and urged the people not to make the mistake they made in 2015, that resulted in non-payment of workers’ salaries and lack of infrastructure today. He told the people that president Buhari has done well for the state, in particular, and the South East in general, citing the Second Niger Bridge, reconstruction of, hitherto, abandoned roads in the area and the school feeding programme, and urged the people to vote for Buhari. The APC governorship candidate in the state, Dr. Uche Ogah, in his address, informed the president that Abia State has been taking over by APC and the people have decided to vote for him. Ogah said the people of the state are tired of the PDP government which, he said, has ruled them without anything to show for it, and promised that within seven days of his inauguration as governor, he would bring in Julius Berger to build Abia roads. He said over 100 companies in Aba alone have closed down, as a result of lack of infrastructure and promised to make sure all of them return if he is elected as governor. Earlier at the palace of Eze Isaac Ikonne, Enyi 1 of Aba, the president said Nigerians have exhibited a lot of potential that needed to be fully harnessed, and promised that his administration will continue to provide the needed infrastructure to enable them thrive in all sectors. Eze Ikonne, while receiving the president, thanked him for executing projects that have impacted positively on the lives of the people. He called on the people of the state to vote for President Buhari in the February 16 presidential election. In his remarks, Okwukwu denied claims that the group had endorsed the presidential candidate of any political party for the February 16 election, as was reported by the media last week. “I’m the secretary and custodian of the secretariat of the Ohanaeze, and I know we’ve not adopted the candidate of any party for the presidential election. It is not true at all,” he said. The secretary thanked president Buhari for showing love to the Igbo, by implementing projects that have touched their lives. He praised the president for visiting the two main commercial cities in Igboland, Onitsha and Aba, during his campaign tour. “President Buhari has done what no other candidate has done. He has visited Onitsha and Aba, our main commercial cities.